I’ve written quite a number of articles about attitude. Most of them deal with tips and tricks on how to approach Chinese in such a way as not to be daunted or scared. This time, though, it will be about living abroad and various ways of doing that. Using a somewhat special definition of “tourist”, I will argue that there is a big difference between truly living abroad and just being a tourist in a foreign country. This is related to my earlier article about the fact that you won’t learn a language simply by living abroad. 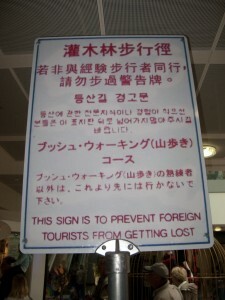 This matches the traditional definition of tourist quite well in some cases. Most people in Northern Europe who go to the Mediterranean for their summer vacations aren’t very interested in the countries they go to. They want sunshine, some good food and a pleasant week of relaxation. Perhaps they go visit some famous places, but the point is that during this time, they don’t do anything differently from what they do at home. They talk mostly with people they know, arrange activities the way they would at home and think the same way. In other words, they are tourists. It’s fine to be a tourist if sunshine, food and a good time is what you’re after, but it’s not such a good idea if you want to learn a language quickly. Here is where the above definition of the word tourist differs from the normal one; you can live in a foreign country for years and still be a tourist! I witness this every time I see exchange students at the university. The French students almost only socialise with other French students, the Spanish with other Spaniards and so on. There is no interaction with locals. At best, people socialise with other exchange students or travellers, but this is just a more advanced form of tourism. I think that the reason for this kind of behaviour is simple enough: convenience and safety. Going abroad is in itself quite an overwhelming experience and might not be easy to handle for some people, at least not in the beginning. Therefore, clinging to friends who speak the same language is a good way to survive, and going on doing things the same as at home lends a sense of stability to life that is greatly appreciated. This is only natural and should only be fought immediately if you think that you’re strong enough to do so. However, even if some people aren’t independent enough to truly engage with a new society from day one, there is no reason whatsoever that even the most timid people shouldn’t start doing that after a while. If you want to learn the language, you have no excuse at all to behave the same way after living in the country for three months (or indeed three years) as you did when you first arrived. If you’ve read this far, you’re probably not the kind of person who just immerses yourself in a new society with no second thoughts or worries (that kind of reader wouldn’t need this kind of article). As usual, I think that being aware of a problem is the first step in solving it. We’ve done that now, so what’s next? Baby steps to more integration. Take small steps and make efforts to change parts of your life to better suit the country in which you live. Abandon some activities you don’t really like anyway and change them to others which naturally brings you into contact with the society in which you live. How fast you change will depend on your personality. This article is not about how integrate with the local society when living abroad, but rather a reminder that the right attitude is key. If you go abroad for a longer stretch of time to learn Chinese, truly live in China, don’t go there and be a tourist like everyone else. My mother has often noted that much of the population of San Francisco consists of long-term tourists (they live in San Francisco for a few years and then return to their home town or go to wherever they will settle down). I consider myself to be a long-term tourist in Taiwan – I know I will return to the United States, so I don’t want to put my roots down too deeply here. But I am also learning Chinese (which is why I am reading this blog). And learning Chinese is definitely one of the reasons I moved out of Taipei – I am learning much more quickly now that I am in a location where, in order to get basic daily stuff done, I have to use Chinese, and I have a lot less support from the expat community (I found the expat community essential when I first arrived, but now I do not need that support as much). Of course, my spoken Chinese is now good enough that I can meet my daily needs, so as far as speaking skills I am treading water rather than advancing. However, I am now focused on my listening and reading skills, so I OK with the fact that I am not progressing in speaking skills right now. Once I have attained my goals vis-a-vis listening and reading, I will go back to working on my speaking skills. I realise that most people can’t or won’t simply throw themselves into a new society with no lifeline at all. I’m actually a rather cautious and shy person myself, even though I went to Taiwan on my own and didn’t know anyone when I arrived. It was quite tough at times, but I still managed. Once my Chinese started improving, things became a lot easier (just like you say). In short, I understand why people are tourists and if that’s a deliberate decision, that’s fine. 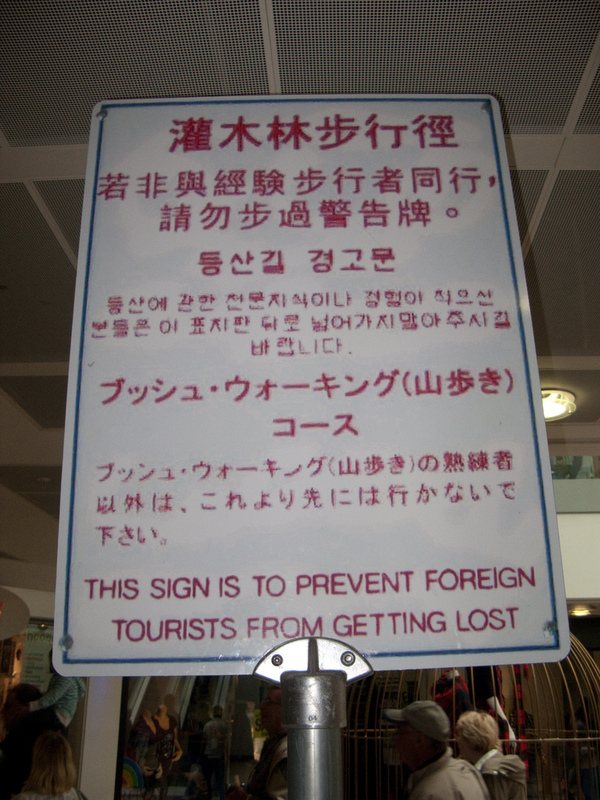 I’m not telling people what to do, but I am saying that tourists will learn less Chinese. This is still a matter of balancing what you can cope with with what you want to achieve, which might be tricky. As I say in the article towards the end, I think “baby steps to more integration” is the way to go. If you take small steps for a long time, you will still come a long way. The “nothing American” rule really helps push me to try new things and avoid the tourist mentality. The “Chinese only” rule is partially about practicing the language, but it also makes me feel more integrated with the country and less like an outsider. My Chinese is only low-intermediate, so I definitely struggle a lot, but it’s definitely worth it. Sounds like very good rules!